Ceramics are amazing materials—strong, light and with amazing thermal properties. 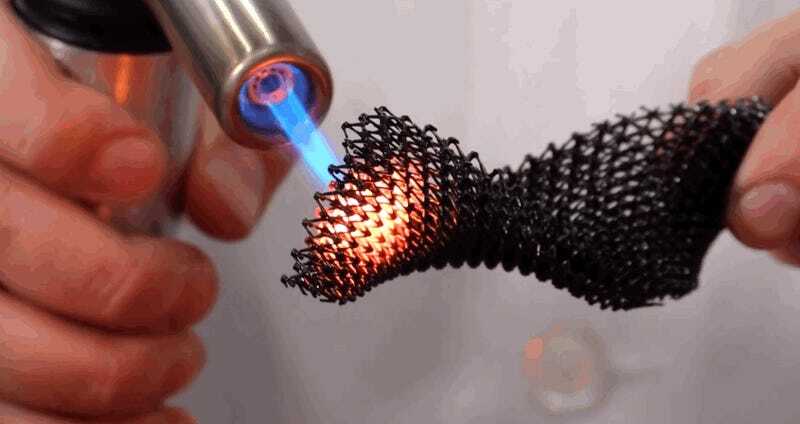 Now, researchers have developed a new way to 3D print the materials more effectively than in the past, and the results can withstand temperatures of 2,500°F. Most ceramic 3D printing uses complex techniques to deposit layers of the material on top of each other, and as a result have to use materials with relatively low melting points. The techniques can also only be used to create fairly simple shapes. But a team from HRL Laboratories in Malibu, California, has developed what they call a pre-ceramic resin, which they can 3D print much like regular polymers into complex shapes. The process, known as stereolithography, fuses a powder of silicon carbide ceramics using UV light. Once the basic shape is printed, it can be heat-treated at 1,800°F to turn the pre-ceramic resin into a regular ceramic object. In fact, this is the first time silicon carbide ceramics have ever been 3D printed. With fewer limitations on the kinds of materials that can be used, the resulting objects have superior qualities to normal 3D-printed ceramics. With fewer flaws than their counterparts, they resists cracking for much longer, and they can also withstand far higher temperatures, shrugging off 2,500⁰F with relative ease (see the clip above). Many metals will melt before that. The research is published in Science. Perhaps unsurprisingly, the folks at HRL Laboratories reckon that the technique could be used to quickly build new parts that need to resist heating and high temperatures—such as the components used to build hypersonic vehicles and jet engines.